How many bus-powered portable hard drives have you seen that come with HDMI ports that plug directly into your HDTV, enabling you to view photos, movies, and even listen to music without a computer? And how many of those come with a remote control? The new LaCie LaCinema Rugged looks similar to the other drives in their Rugged product line, but boy is it different. 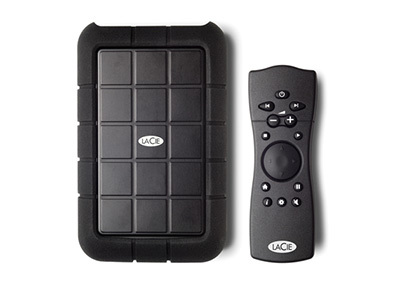 It comes in two capacities (250 and 320 GBs), connects to your computer via USB 2.0, and has a variety of output options: video (composite video + stereo audio), HDMI, optical video, analog stereo (via A/V cable included), and optical audio. It can play a variety of formats including: MPEG-1, MPEG-2 (AVI, VOB, IFO, ISO), MPEG-4 (AVI, XviD), plus audio and Jpegs. 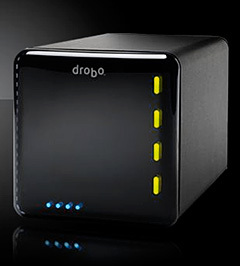 And if you want, you can even use it as a regular backup hard drive via the USB 2.0. The pricing is a reasonable $219 for the 250GB model, and $249 for the 320GB drive. I couldn't find anywhere they were available yet, but they should be in stock at the usual places soon. Once you download the trial version of Photoshop CS4, you have 30 days to freely explore, test, and enjoy its bounty of new features. Here are a few things I'd look at during the trial. Review Mode in Bridge. I've really become hooked on this carousel approach to sorting images. Enable by pressing CMD-B or CTRL-B. Use right and left arrows to navigate, and the down arrow to drop images out of the carousel. Once you have your favorites, use the Make Collections icon to save them as a group. Collections in Bridge. 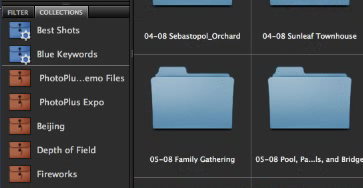 These virtual folders are like Albums in iPhoto and Aperture, and similar to Collections in Lightroom. They finally give us the versatility to group images without messing up our filing organization. Graduated Filter in Adobe Camera Raw. What a great addition this is to ACR! 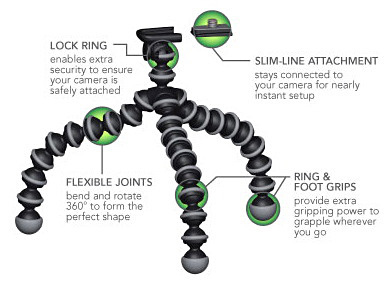 Not only can you use it for tonal adjustments, but for color and sharpness too. You'll find it in the toolbar at the top of ACR. Localized Corrections with the Adjustment Brush in ACR. Another killer tool that allows you to work on specific areas nondestructively. You'll find it in the toolbar at the top of ACR. Targeted Adjustment Tool in Curves and HSL Adjustment Panels in Photoshop. I like the new Adjustment Panel that automatically creates a new layer for you. But I really like the Targeted Adjustment Tool in the Curves and HSL panels. Birdseye View in Photoshop CS4. Great navigation addition. When you're working with an image at magnification, hold down the H key and click. 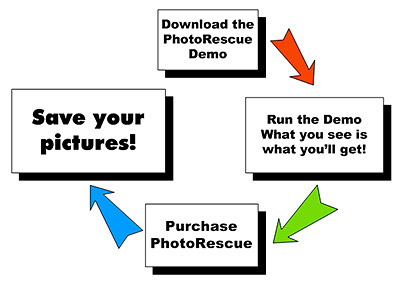 Photoshop takes you into Birdseye view enabling you to easily navigate to another area of the photo. You have to see it to believe it. And zooming (Z) in general is smoother and more fun. Try it. 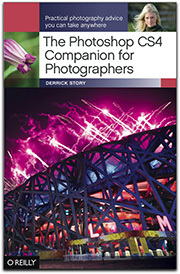 Another recommendation is to get the book, The Photoshop CS4 Companion for Photographers before you download the trial. This 190 page guide will only set you back $16.49 on Amazon, and it can serve as your navigator for exploring Photoshop CS4. If you decide CS4 isn't for you, then you can pass the book along to someone else. If it is for you, you have the perfect companion for learning the new application. Of all the features that Amazon offers its customers, reviews submitted by people who read the books are still the most useful. This is especially true when a book takes a specific approach to a subject, such as what I've done with The Photoshop CS4 Companion for Photographers. 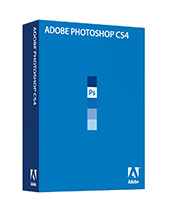 Unlike other Photoshop manuals that try to cover all of the tools, I filter through hundreds of features to present the most important ones for photographers who want to use CS4 as their photo workflow application. When I read the first Amazon review for the Photoshop Companion, it was interesting to see that the book was perfectly suited for what that customer wanted (David J. McKee). By David sharing his thoughts, he helps both those who have similar needs and those who may want something else. I'm mentioning this because, if you've read The Photoshop CS4 Companion for Photographers, and you have insights about it that might be useful for other photographers, I encourage you to post a review on Amazon. It's like so many other things we do on The Digital Story: share our ideas and our work with each other. As I had mentioned in earlier posts, this had been an unusual week of diving for me. The swell from the north kept things churned up thereby decreasing visibility. The skies were variable, and when overcast, that also affected how things looked underwater. And, to top it off, I had gone all week without seeing a sea turtle. I figured that my week was now complete, and I should probably think about heading home. It was a terrific conclusion. Photo by Derrick Story. 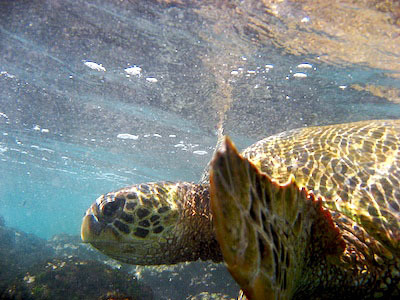 Captured with a Canon SD700 IS in a Canon underwater housing. Camera set to Underwater Scene Mode. The morning was overcast, which is always a drag for snorkeling. But a little light broke through in the afternoon. So I geared-up and headed straight out to the third buoy on my beach. Between the swell and wind, I wasn't expecting much. But to my surprise, I had one of my better shooting sessions underwater. I guess you just never know for sure. It seemed like all of the fish were out. 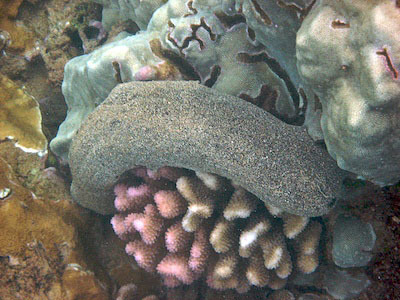 One of the more interesting creatures was this Sea Slug draped over a handsome coral. He was probably about 18" long. I appreciated him striking an elegant pose. Photo by Derrick Story. Captured with a Canon SD700 IS in a Canon underwater housing. Camera set to "Underwater" scene mode. When I'm on vacation, I try to be more like a normal person and less like a photographer. One of the ways I do that is to put a compact camera in my pocket and leave everything else behind. This usually means that I'm shooting Jpeg. It's funny, now that I've been shooting Raw for a couple years, I really notice a difference when I process Jpegs in Aperture. I'm so used to being able to recover vast amounts of image data in the highlights and shadows. I have so much information to work with regardless of the slider I'm using. After processing a day's worth of Jpegs, I feel like I'm image editing with one hand tied behind my back. I move a slider expecting a certain result, and the image just doesn't respond "right." It's a good reminder of just how powerful Raw photography is. Does this mean I'm going to start lugging all my photo gear around? Nope. I'm still on vacation. I'll shoot Raw when it's convenient. But the rest of the time, I'm still going to be a tourist. 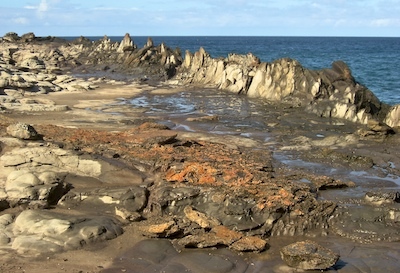 Photo of Dragon's Teeth formation near Kapalua, Maui, by Derrick Story. Captured with a Canon SD700 IS in Program mode. A new and terrific feature in Bridge CS4 is Collections. If you haven't heard of them, they are virtual folders that you can use to view your pictures in various groupings without compromising the integrity of your organizational structure. So you can pull a picture from here and from there, put it in a Collection, and use that for display or publishing. When you're done, you can discard the Collection, and there's no impact on your organizational folders. I've published a new screencast on CS4 Collections that shows you the ins and outs. They are quite handy.